Whatever you call him – Santa Claus, Saint Nicholas, Father Christmas, Kris Kringle, Pere Noël, Sinterklaas or any of his dozens of other monikers – nothing says “Christmas” like the jolly old fat fella! Here’s doodle #4 in December’s “’tis the season” series, which began on December 1 with the Musclebound Thug’s Santa Claus impersonation and continued on December 3 with this Christmas tree and December 7 with a Christmas stocking stuffed with gifties. Total distance for the ride was 34.7 kilometres (21.6 miles). 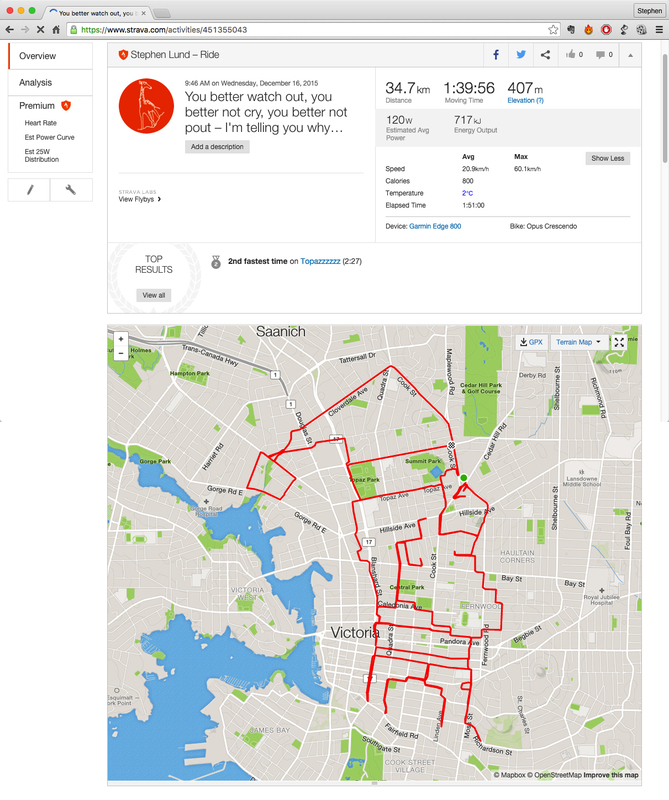 This entry was posted in gps art and tagged bicycling, Christmas, creativity, cycling, Father Christmas, garmin, gps, gps art, Pere Noel, Saint Nick, Santa Claus, strava, strava art, urban art, victoria bc. Bookmark the permalink.